Pickleball, Anyone? Senior Athletes Play New Games And Old The National Senior Games taking place in Cleveland have some sports in common with the Summer Olympics, like track and field, basketball and swimming. There's also shuffleboard and horseshoes. 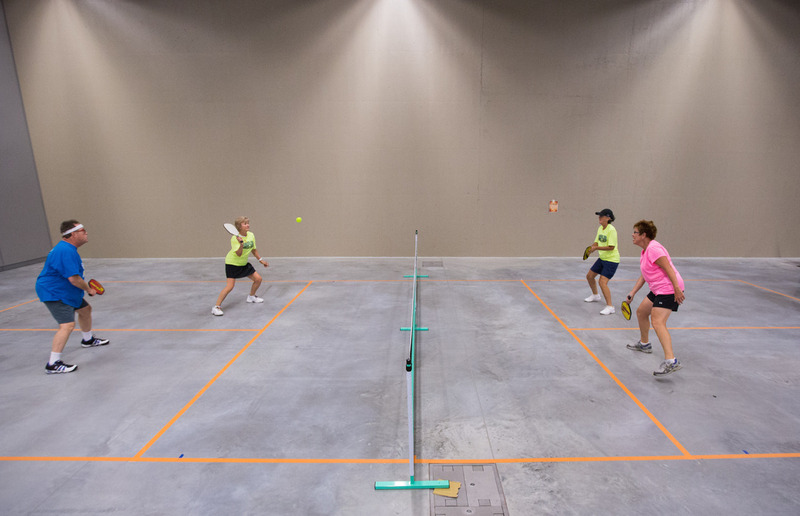 And this year, there's a new sport, pickleball — a tennis/pingpong/whiffle ball hybrid — that's growing fast. Hazel Trexler-Campbell throws spray-painted horseshoes during the Senior Games in Cleveland on July 23. 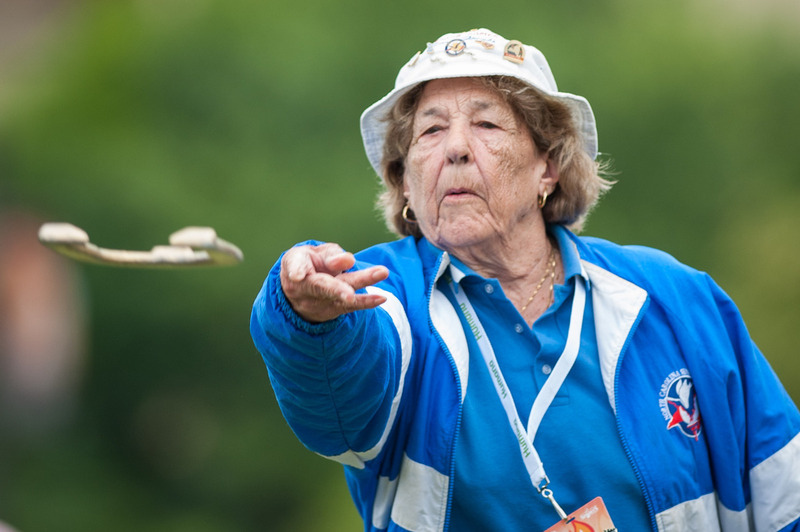 A lot of what you'd see at the National Senior Games looks familiar if you've ever watched the Summer Olympics: There's track and field, basketball and swimming. At the Summer Olympics, however, you will not hear voices in the crowd cheering "Go, Grandma!" 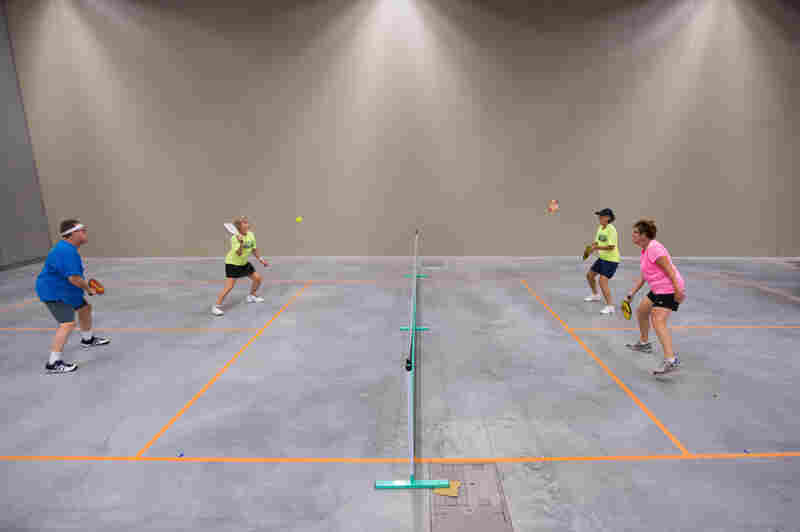 Mike Coats (left) and Rosemarie Pietromonaco return the ball to Beverly Miller and Diane Reynolds in a practice match of pickleball. This is a new sport at the National Senior Games this year. It's halfway between tennis and pingpong, played on a court with a net. But the ball is a hard plastic whiffle ball, and players use paddles instead of rackets. Pickleball was invented in 1965 in the backyard of Washington Rep. Joel Pritchard. According to legend, the game was named after the family dog, Pickles, who chased down the stray balls — which is a great story, but probably untrue. In any case there are now around 150,000 pickleball players in the United States. The game's grown fast and it's played fast. You have to be in shape. That describes Rosemarie Pietromonaco. She discovered the sport about 13 years ago when she moved to a Florida retirement community. 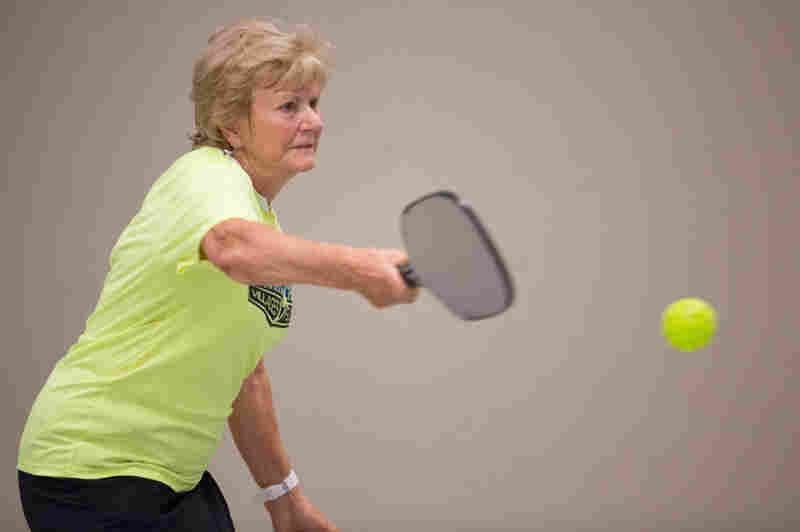 At the National Senior Games, she's competing in singles, doubles and mixed doubles in the 70 to 74 age bracket. "Everyone knows your age because of the games," says Pietromonaco. "It's just not something that we're ashamed of. We're proud of it because we're [still] playing." Rosemarie Pietromonaco practices pickleball at the Cleveland Convention Center on July 27. Shuffleboard and retirement seem to go together like, well, shuffleboard and retirement. But the game is played competitively and with dead seriousness at the Senior Games. Marcus Hurley, 65, of New Mexico says the game appeals to him. "I'm a disabled vet, and I can't do the arduous stuff anymore. But shuffleboard requires as much thinking and finesse as anything else." Indeed, it's the Goldilocks of sports. You can't push the disk too hard or too softly; it has to be just right. And the game has its nasty side: You can negate your opponent's score by knocking his or her disk out of position. "There is a lot more to it than people think from just watching a two-minute segment on The Love Boat," says Hurley. And he would know. He won the gold medal in men's singles in his age bracket. Hazel Trexler-Campbell won her first game against Mary Szulborski. Mary plays in the 85-89 age division, but played against Hazel in the 90-94 age division because Hazel is the only one in her age division. Hazel won gold by default. 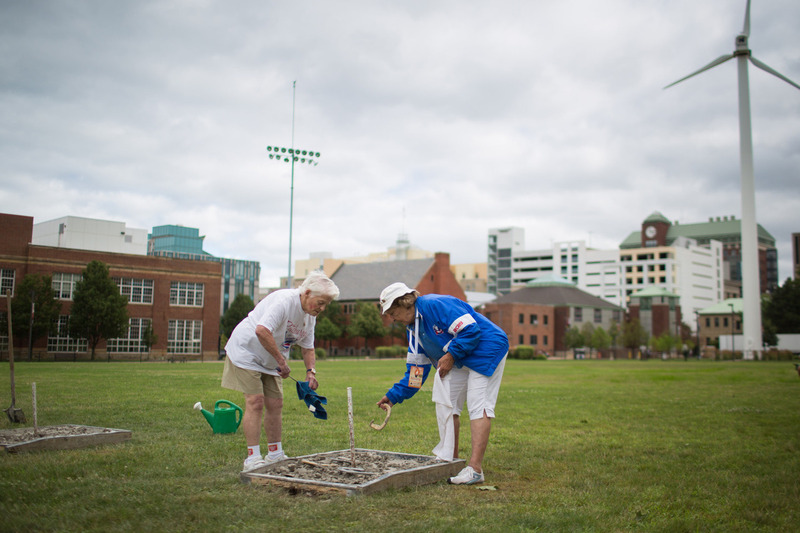 Hazel Trexler-Campbell, 90, says she's been pitching horseshoes "since I've been alive." She grew up on a farm in North Carolina and had four brothers. "That was our only game when we were young." Back then, they played with actual horseshoes that horses wear, not the larger, heftier ones used for competition now. Trexler-Campbell has painted hers gold, inspired, perhaps, by the seven gold medals she's won over her years of competition. She won gold in horseshoes again this year, but by default: She was the only competitor in her age group. When she began competing at the Senior Games years ago, she says she didn't win many medals. "So I tell people, if you can't outrun 'em, outlive 'em, and then you'll get your medals." Trexler-Campbell won some other gold medals at these Senior Games in sports where she did have competition. She won gold in the discus and in shot put, where she set a new Senior Games record. Her explanation for all her athletic success? "I guess it's just because I like to throw things."